THE ONE THAT GOES ALL THE WAY! Banned and heavily censored the world over, here is a film that surpasses its reputation as a shot-gun blast to the senses. 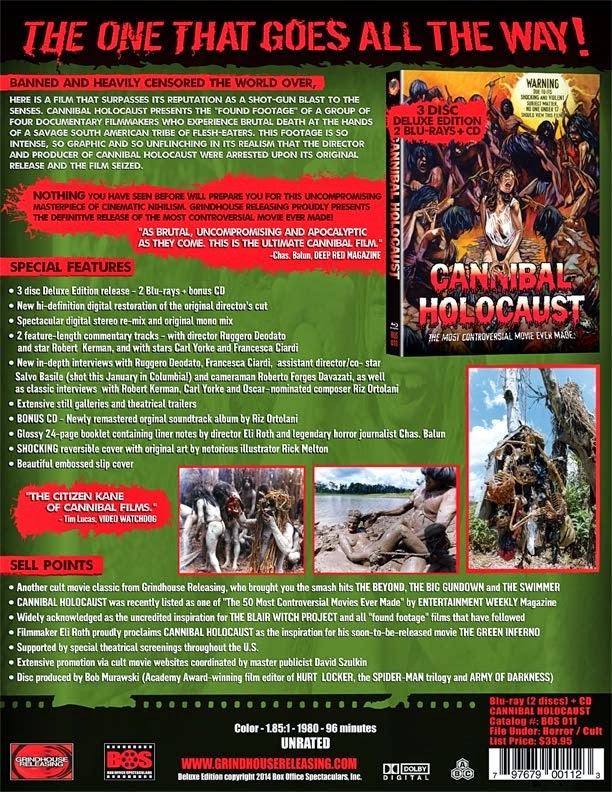 CANNIBAL HOLOCAUST presents the "found footage" of a group of four documentary filmmakers who experience brutal death at the hands of a savage South American tribe of flesh-eaters. This footage is so intense, so graphic and so unflinching in its realism that the director and producer of CANNIBAL HOLOCAUST were arrested upon its original release and the film seized. Nothing you have seen before will prepare you for this uncompromising masterpiece of cinematic nihilism. Grindhouse Releasing proudly presents the definitive release of the most controversial movie ever made!